A 900-year-old mummified woman lies on her side, her legs tucked close to her stomach, her head resting on the remains of a child. Cradled in her body, another child lies wrapped in fabric and plant fiber. But this second child, about 300 years older than the woman and the first child, was likely from a different region in South America altogether. 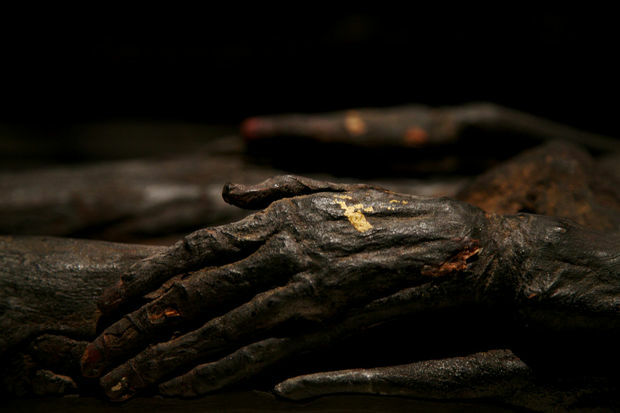 Mummies are a bit like centuries-old encrypted books. With new, largely non-invasive techniques, scientists are piecing together the chapters of their ancient tales. Mummies of the World, an exhibit at the Oregon Museum of Science and Industry, highlights how anthropologists, biologists, pathologists and forensic analysts unravel secrets from preserved remains that retain a skeleton and some hair, skin, organs or muscle. "Surprisingly for people who are dead," said Heather Gill-Frerking, director of science and education for the exhibit, mummies "really can provide a huge amount of information." The Reiss-Engelhorn Museum in Germany loaned many of the exhibit's specimens. 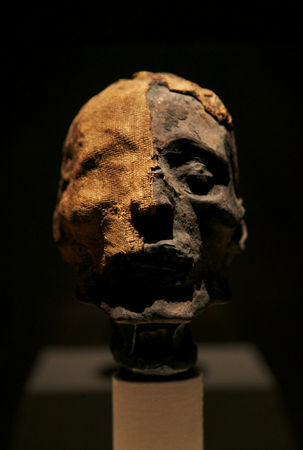 Thought to be lost in World War II, a cache of 20 mummies from around the world was found in a museum vault in 2004. Since then, scientists have used advanced techniques like DNA testing, bone and soft tissue analysis, CAT scans and radiocarbon dating to understand the age, health, ancestry and living conditions of these people 200 to 6,500 years ago. CAT scanning, or computer tomography, is one of the most important tools for studying a mummy. "CAT scans show vertical slices, like an old-fashioned hard-boiled egg slicer," said Sarah Weisseman, a retired archaeologist for the Illinois State Archaeological survey. From those, scientists can reassemble a digital 3-D version of the mummy without lifting a single, delicate bandage. "Mummies are a non-renewable resource," Gill-Frerking said. Scans can discover items like amulets hidden in the wrappings, bone structure, signs of disease and causes of death, such as tuberculosis. The scans have even shown that some mummies suffered from atherosclerosis, or clogged arteries, long considered a modern disease. While high-status Egyptians ate rich, fatty meals – a common factor in heart disease – similar signs of ill health were also found in South Americans, who had much healthier diets. This supports the idea that arterial health could have a genetic component. When objects are found in the mummy wrappings, scientists can now use 3D-printing to better understand the shape of the object. For example, a digital scan of a woman in the exhibit showed something in her hands. A print of those objects cleared up the mystery: She clutched a baby tooth in each fist. Bone, hair and nail analyses uncover details about diet and any drugs or substances used in the months before death. Certain ratios of atomic isotopes in bones can indicate a fish- or plant-based diet. Teeth give clues to diet, age, ancestry, and even ethnicity. The presence of baby teeth or wisdom teeth can give clues about a mummy's age of death. Teeth are also the staunchest protectors of DNA, the genetic material that tells our bodies how to function and hints at our histories. DNA is a treasure for any forensic scientist, since it degrades with time even in ideal conditions. However, teeth and bones sometimes provide enough genetic to test ancestral markers, link relatives and possibly pinpoint a geographic origin. Not all the DNA from mummies is human, though. Bacteria and parasites also leave DNA traces. Their genetic "fingerprints" can help track the evolution and mutation of diseases like tuberculosis -- all pieces of the bigger story. A few pages of each story might inevitably be lost to time, but as technology improves, mummies will become more and more of an open book, bacteria and all.